"Thine inland seas, Thy groves and giant trees,Thy rolling plains;Thy rivers' mighty sweep,Thy mystic canyons deep,Thy mountains wild and steep,--"
of which we sing, and where stronger 'garden' histories arise (of the garden as opposed to the natural or presumed natural landscape) they are generally in more urban regions of what remains a sparsely populated country, for its size. But Frances Benjamin Johnston--pioneering photographer, photojournalist, visual artist, whose garden photography, 1895-1935 is the subject of a truly beautiful new book by Acanthus Press--was a city girl and saw the making of gardens as a way to improve urban conditions, presaging modern trends like the urban farming movement and guerilla gardening. "...to turn unsightly backyards into gardens, to beautify all waste places, to plant trees near important buildings and on long treeless streets, to encourage window-box planting, and to be observant of the workings of the park department, in order that we may make city life richer by fostering the love of beauty..."
"...we feel that it is very necessary to have photographs for successful developments so that people can clearly see the possibilities of their own backyards, and receive inspiration". 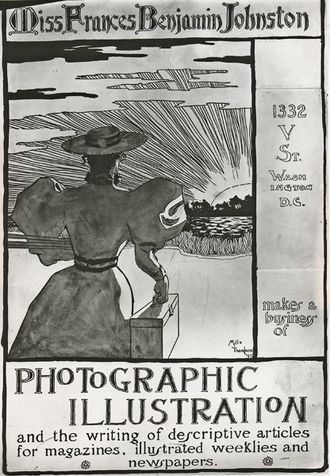 A celebrity photographer, FBJ shot the wedding of Alice Roosevelt, portraits of successive US Presidents, and produced vanity garden spreads for wealthy homeowners as well as photographing gardens for 'magazines of class'. But she used that access and patronage to further her own goals, to do things like documenting vanishing colonial architecture or the success of the agriculture college in Hampton, Virginia, where Booker T. Washington went to school. 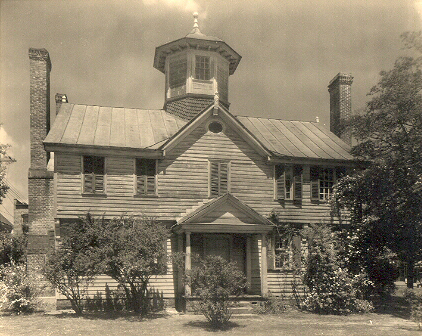 Cupola House, Edenton, North Carolina; in the Frances Benjamin Johnston Collection, The Wilson Library, University of North Carolina at Chapel Hill. In these efforts she was catholic in her taste, photographing both hovels and plantation houses. Her garden photography, though heavily weighted toward the rich and famous, shows this same expansiveness, an appreciation of the beauty to be found on the stairs to a basement apartment, as in my favorite photograph of the collection, the Janitor's Garden. Most of the photos are something of a Social Register for Gardens, with hand-coloring in FBJ's preferred Ruskinian idealism to boot. So you'll find the Vanderbilt estates here, and some of England and Italy's most famous gardens, but I am more enamored of the Rhode Island Farmhouse and the sandbox in the back of a doctor's townhouse and the California adobes (present day Californians could learn much from the appropriateness of these landscapes to their settings). I had seen some of these images before, but without proper credit to Frances. Now they're all appropriately catalogued, thanks to years of efforts on the part of the book's author Sam Watters. 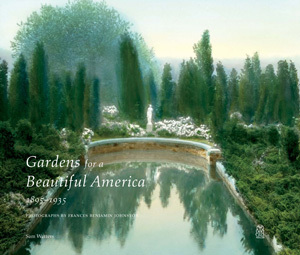 They are freely online at the Library of Congress, which holds FBJ's archive, but it is much nicer to have them along with the informed discussion of the American Garden Beautiful that the book provides. The lovely folks at Acanthus Press have made a copy available to give away to you, dear readers! Just leave a comment to this post by midnight CST on Monday, May 14 to be eligible. You can leave any sort of a comment, but of course I always like to hear nice words about the blog. Nice or not, though, all comments will be numbered and the winner selected by random number generator on Tuesday. Bonne chance! As someone with an art history degree I love nothing more than a great garden historian. Garden history is fascinating and I think it's fantastic to see a book like this out there. I love your blog and I'm not just saying that as an I'd-love-the-book comment. Wish you had time to write more often. Living somewhere south of Hampton and somewhat north of Edenton, I would love to participate in thy contest. Sounds like a fascinating book. Love your blog, too. I live in Portugal and I follow your blog since you've started it. Don't ask me how I got here. Some link from some comment on my garden blog. You made me discover another side of gardens to explore: its history. Since then I read many of your book sugestions and of course your posts in the blog. It made me look to gardens differently. Thank you and please do continue to write! Hi garden History Girl, I want to post a comment in order to win the book. I really like your articles. My husband is a desert gardener. I am an artist and I love painting landscapes. Thank you for your blog. I read the whole thing when you send them. Thank you. As head of grounds here at the historic Sherwood Mansion located in Northern Baltimore Maryland, I would like to say you are an inspiration to my work and ongoing education of my passion. I look forward to every posting available. Thank you for your devotion to all of us. Thank you for yet another informative, visually entertaining blog entry. 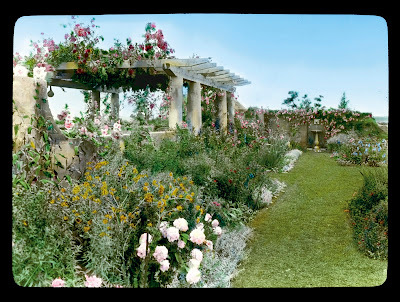 As a garden photographer, I am always encouraged and excited to learn about gardens and landscapes, the only records of which may be the photographs that were taken of them. How do you find the examples you write about? Are there any landscapes or gardens you would recommend be photographed? Carry on! I love the eclectic nature of your bolg-- love whatever and whenever you post. Great, informative post. Thank you for sharing these photos! I don't remember how I found your blog about a month ago, but I am so pleased, when I see you post! Always so interesting and creative, great photos and enjoyable conversation. Very kind of you to offer a book to those who comment. Thank you for your very interesting blogs. I’d love to be entered for the draw for what looks like a very unusual book to add to my growing library. While I was in Carolina and Washington in 2010 I visited lots of gardens including Dumbarton Oaks. This book would be a joy to have-to return to again and again.I do appreciate your blog and the connection I feel to gardeners in the past when I read your pieces. Thanks for doing it. I'd seen these photos before, but your conversation about them - as always - makes them come to life. Thank you. And keep 'em coming! 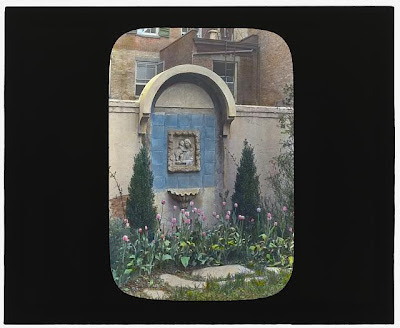 I just recently learned about FBJ's terrific collection of lantern slides available online through the Library of Congress but as usual you have made the story so rich and interesting. 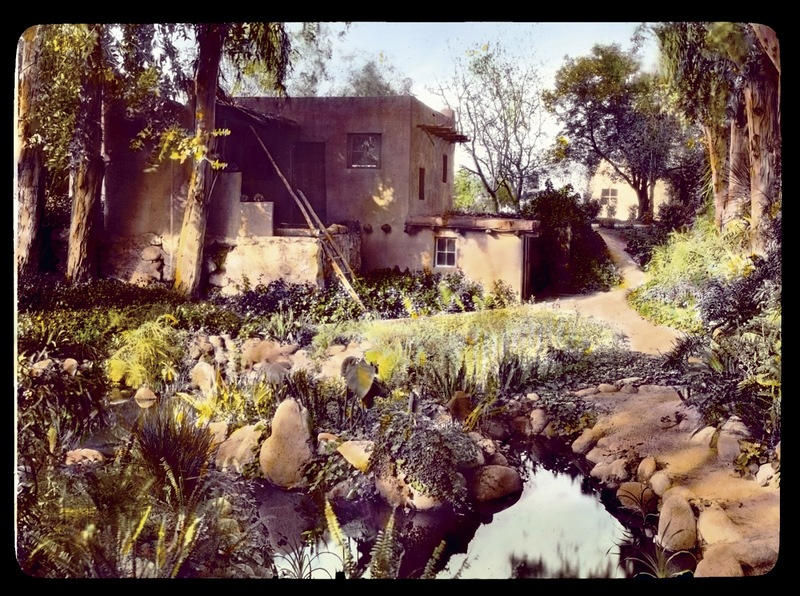 These slides were my first introduction to the Garden for a Beautiful America movement and I would love to read the book and learn more. 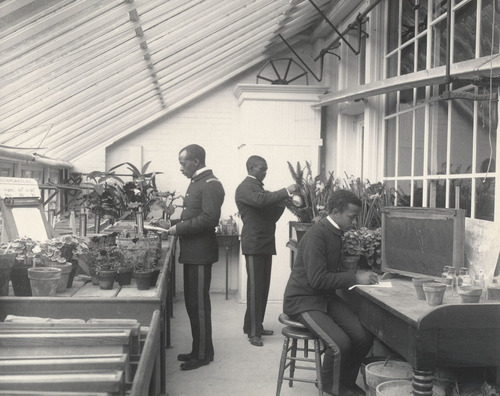 Thank you for your wonderful blog--I'm always excited to see an email update in my inbox from Garden History Girl! Your posts are delightfully eclectic, just like I imagine this book to be. 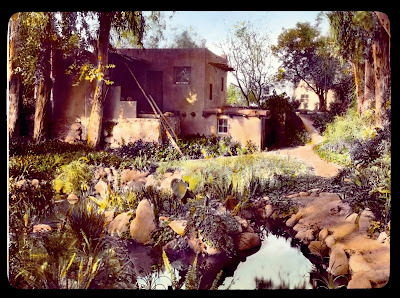 I'd love to learn more about historic adobe house gardens among the others. What a treat it would be to win! New gardens are lovely but there is just something about a garden that has see so much history. Old photographs, especially crisp black and whites tell so much with so little! 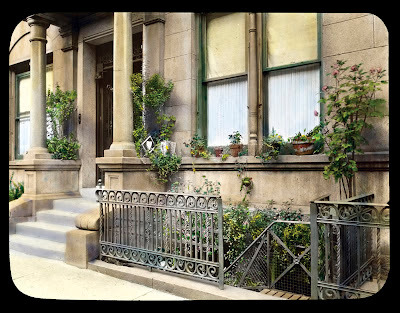 I'm hoping I'm just getting in under the deadline. . . . Frances Benjamin Johnston deserves to be better known today.